CHAAT is a street food. It is served as side dish or snacks. It is more popular among North Indians. Chaat is made with boiled potatoes (Aloo). The potatoes are shallow fried and served by mixing other spices, onions and various mouth-watering chutneys. Chaat too has many variations and flavours that include Aloo chaat, Aloo-chana chaat, Aloo-green peas chaat, papdi chaat, samosa chaat, pani puris, basket chaat and many other. “Chaatna” is the hindi word of chaat which means to taste. Today, I am going to make Aloo and green peas (matar) chaat. However, making chaat with Aloo is very healthy as it contains dietary fibers and good source of vitamin B-6 and vitamin C. Whereas, Green peas which is also known as Hari matar or garden peas or Chhimi are also very healthy. The green peas are rich in minerals, vitamins and anti-oxidants. Fresh green peas are available in winters only. For the rest of the year you can get the frozen one. Chaat is favourite of young and old. Even Kids cannot stop themselves to take their hands off from the yummy dish. It’s a mouth-watering dish. Here is the recipe card of Aloo Matar Chat. Boil the potatoes. After boiling, let it cool down. Take a pot and mash the potatoes (Aloo). Add two pinch of salt and two pinch of cumin powder. Mix well and make the tikki of Aloo. Keep it aside. On the other hand, take green peas and wash it. In a pressure cooker, heat 2 tspn oil, add 1/4 of onions and fry it. Now, add 1/4 tspn ginger-garlic paste mix it for 20 seconds. Then add matar to it. Mix well, add salt and red chilli powder according to your taste. Now, add cumin (zeera) seeds and little water to it. Cook it until it is done. 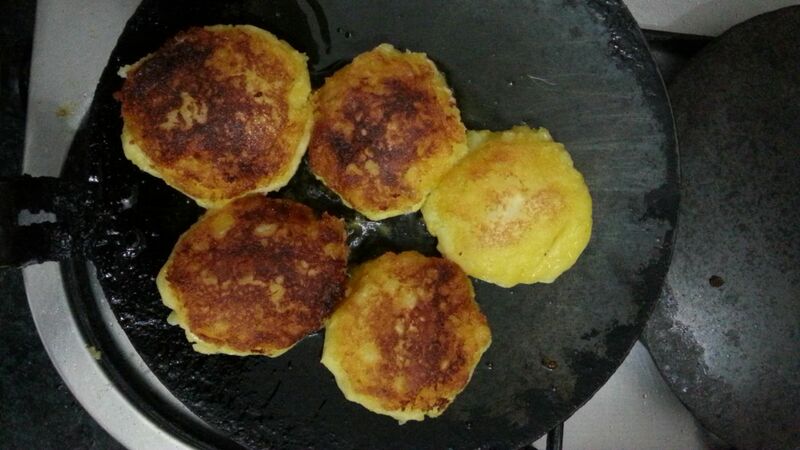 When matar is ready, start shallow frying the Aloo tikki. Beat curd with beater for 5 minutes to make it smooth in consistency. After frying aloo tikki, assemble in a serving dish. First, place Aloo tikki then curd, add little salt, green peas, chopped onions, chutneys (Imli and green chutney), zeera or cumin powder, red chilli powder (according to your taste), pinch of black salt over it. Take a papdi or puri of paani puri, break it with your fingers and spread over the mouth-watering Aloo Matar Chaat. Now, here is your tasty, yummy Aloo chaat is ready. Have it and Enjoy every bite of it with different flavours mixed so well. I cannot resist to make it again! Find the recipe of Imli Ki Chutney here, if you haven;t made it yet.